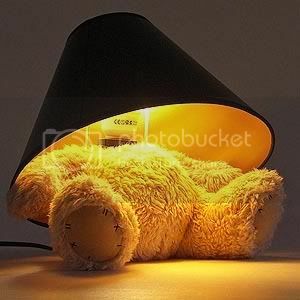 BizzNtech | Teddy Bear Lamp- I Can’t Find your head Mr Teddy! Teddy Bear Lamp- I Can’t Find your head Mr Teddy! We all love teddy’s but would you like one without a head? I don’t think so. Well, unfortunately here’s one without a head. Looks like it sacrificed its head for the sake of a lamp shade. Hmmm, looks weird! I would certainly not keep this thing in my room. If I keep this thing in my room I’m sure my little sister will try to separate it from the lamp which is even more disastrous. In addition to this some children will try to peep to what’s Mr. Teddy doing in there and they’ll be shocked to find its head missing. Well, if you don’t care about the teddy’s head and you’re more bothered about the lamp then you can get one from here for $85. It would have been better if some other animal was used, maybe a Lion, camel or anything for that matter instead of our dearest Teddy.